It could be argued that the original Apple AirPods popularized the true wireless earbud format, and despite an initial disdain for what was considered an unusual-looking design and high price point, they have become one of the most popular true wireless earbud models. Now Apple has released the new Apple AirPods (2019), which reportedly come with an optional wireless charging case, improved battery life, smart Siri assistant functionality. So what's the difference between the old and new generations? Read on as we examine what's changed, and perhaps more fittingly, what's stayed the same. There’s no denying that the Apple AirPods paved the way for true wireless earbuds to become mainstream, and despite being released in 2016, they were still among the best true wireless buds you could buy in 2019 – that is, until the Apple released the updated Apple AirPods (2019). According to Apple, the upgraded buds will deliver "faster connect times, more talk time, and the convenience of hands-free Siri." But what else has changed? This is the same price as the originals, which are no longer being sold by Apple, but should be available from third-party retailers while stocks last. We haven't seen any price reductions yet, and the likelihood is that Apple will just let the stock run down until only the 2019 model is available to buy, without reducing the price. There's not a huge difference in terms of design between the AirPods (2019) and their predecessors. Apple has a very distinctive style, and the AirPods stick to this aesthetic quite rigidly, which you will probably either love or hate. The Apple AirPods essentially took the classic EarPod design and just removed the cables, leaving the stem of the bud to hang out of the ear. The stem is relatively thick as it houses the buds’ microphone and battery, which makes them even more conspicuous – like we say, it’s a love/hate design. Likewise, the AirPods (2019) are completely cable free, drawing battery from a pillbox-like charging case, with stem-like protrusions from the buds. True to that rigid Apple design, you won’t find modern conveniences like replaceable silicone eartips that secure the either the original AirPods or the AirPods (2019) firmly in your ears, and although the originals felt relatively snug when we tested them, we’d think twice before wearing them while working out. It's the same story with the Apple AirPods (2019), which we've been able to test briefly in our Apple AirPods (2019) hands on review – although we will be testing the fit more thoroughly when we come to carrying out our full review process. Connectivity has always been a bit of a sticking point when it comes to true wireless earbuds, but the Apple AirPods have a reputation for seamless pairing – as long as you’re using an iPhone, of course. The new AirPods (2019) come with even better connectivity however, thanks to a newly-designed H1 chip which Apple has built specifically for the headphones. Apple says this will improve connectivity, speed up pairing times, and increase the efficiency of the battery life, which Apple claims will give you 50 percent more hands-free talk time. When we tested the the new buds, we found pairing was noticeably quicker. The original Apple AirPods have five hours of battery life, while the charging case holds enough power to charge them over four times. Apple says that the inclusion of the H1 chip within the AirPods (2019) will "give you 50 percent more hands-free talk time", but it hasn't revealed an official battery life yet - how long they last as just headphones is the key metric here. Both generations of the true wireless buds can be wirelessly charged now that Apple has launched the new wireless charging case alongside the AirPods 2. This means you can use Qi-compatible charging mats to power the case without having to stick a cable in, which is presumably in anticipation of the launch of Apple's long-awaited Air Power charging mat. Of course, if you get the AirPods (2019) with the wireless charging case, it will cost you around $40 more than if you buy them with the standard charging case. True wireless earbuds get a bad rap when it comes to audio performance, but they are getting better all the time. Even the original AirPods, which are relatively old now, still sound pretty good, with a lively presentation and decent levels of bass – although treble frequencies can sound a bit harsh. There are no differences in sound quality between the old generation and the new AirPods (2019), so most of the changes are centered on connectivity, battery, and wireless charging. Neither of these buds will likely offer the same kind of audio prowess that a really good pair of over-ear headphones will, but you do get the freedom of wireless connectivity in exchange for a slightly less powerful sound. 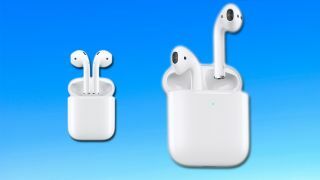 Overall, not a huge amount has changed between the two generations of Apple AirPods, with many rumored features not making it to the final iteration of the AirPods (2019). It doesn't look like these capabilities made the cut, which fitness enthusiasts may find disappointing. We can't say whether the AirPods (2019) are a marked improvement upon their predecessors until we carry out a full and thorough review, but features like wireless charging, "Hey Siri" functionality, and more reliable connectivity will probably only make using the true wireless buds a more seamless experience. It’s also worth noting that there are lots of other brands making true wireless earbuds these days that may suit you better than either offerings from Apple. In fact, our favorite pair of true wireless earbuds are the RHA TrueConnect True Wireless Earbuds, which are the around $10 cheaper than the AirPods 2, and offer a balanced, detailed sound, and a reliable Bluetooth connection.